1st June 1910. Cpls at the Depot trip to the Derby. 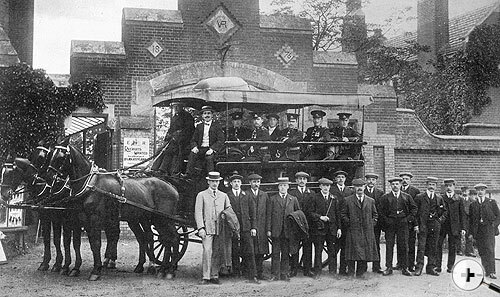 Coach from Stoughton to railway station. Note recruting posters. Between 1905-1910 a brick extension was added to the Hospital building and remodeling of some buildings took place. 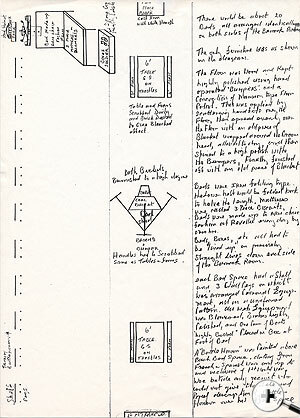 Sketch layout of a barrack room, 1937, Stoughton Barracks, Guildford (see below). There were two Main Barrack Blocks in Stoughton Barracks, each block contained 4 large barrack rooms with a small room (Bunk) for a Non Commissioned Officer, (NCO) at the end of each Barrack Room. Each Barrack Room was approximately 50' x 20', and would have 30 beds, 15 on either side of the room, evenly spaced. At the foot of each bed was placed a box, containing the kit of that particular soldier, (Boxes Soldier). Behind the bed was a shelf and three pegs on which was displayed the web equipment and great coat. This would be the total possessions of a recruit at that time, civilian clothes were not permitted, and were dispatched home at the time of enlistment. Furniture comprised two six foot table and four barrack forms (Seats) two to each table placed at either end of the barrack room, they were scrubbed each day, and rubbed down with brick dust block to give a bleached effect. There was also a metal coal box and a bucket, both were burnished daily to a high shine. 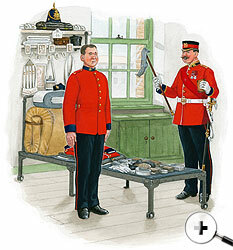 A bumper (Hand operated floor polisher) a broom, coal shovel and poker were the only other items to complete the furniture scale of the barrack room. An open fire place at one end of the barrack room was cleaned out daily and the hearth whitened with a hearth stone. (The fire place would only be used in winter when there was a coal issue). Outside at the end of the barrack room were the ablutions. This room consisted of six wash basins set in a black slated slab. The floor was concrete. Combined with the ablutions was a night time urinal. The main toilet blocks and the bath house and looked after by an orderly, normally and old soldier serving out his time. Beds were made up arm chair fashion each morning at reveille, floors swept and highly polished, personal bed space and equipment set out, and then lined up in perfect straight lines by an NCO, all this had to be completed between reveille and 0800 hrs when the platoon sergeant would appear to inspect the barrack room, and god help that platoon if the Platoon Sergeant had a 'rat on' (Temper) and the barrack room was not up to his standard.